"There are evil fairies in Northampton. They ride bumblebees and hunt with spiny spears harvested from hedgehogs. They’ve captured hornets and lounge on tabletop toadstools feasting on worms and other delicacies. They raid birds’ nests, race snails and dance to the beat of buzzing bees and snail shell drums. Their underground lair, which seemingly spreads as far as the coast, occasionally erupts to reveal glimpses of their nefarious activity. They are plotting, building their army, trying to take over the world and awaiting curious humans to lure into their realm. They do not care for you or any of human kind. But don’t worry, you are safe. Artist Tessa Farmer has captured the fairies and imprisoned them in a time bubble. For now, you can peer into this diorama of menace whilst their activity is frozen. Keep your eyes peeled for The Fairy Ring as it infests Northampton throughout 2018 like a rash of possessed carbuncles. As you walk woodland paths or pass patches of grass – can you see them? And will they be so brazen as to make appearances across the manmade land? Market Square? Abington Street? And what would happen if they got out? The first manifestation is taking place on 17 June 2018 as part of Northampton Music Festival. Watch out!" "Zsófia Jakab is an interdisciplinary artist whose practice is closely informed by research into narrative, art history and folklore. A large body of her artwork to date directly engages with the legacies of Louise Bourgeois, exploring the iconography of the spider and the fairy tale practice of spinning. Originally from Hungary, Jakab recently graduated with an MFA with Distinction from Duncan of Jordanstone College of Art and Design in Dundee. For her first solo show, Jakab will be shown alongside mid-career artists in whose work she has sought particular nourishment, especially Tessa Farmer and Eleanor Morgan. A portrait of Jakab by Chloe Briggs will also tease out and query notions of artistic identity. Artwork by Bourgeois, meanwhile, may be necessarily absent. The term “beckoning” has been borrowed from Mieke Bal’s study Louise Bourgeois: The Architecture of Art Writing (2001) as a way of characterising Jakab’s encounter with her forbearers. An interpretation text by the Hungarian cultural historian Anna Kérchy will accompany this exhibition"
I'm delighted that this collection of essays about my work, edited by Catriona McCara, is now available from Strange Attractor Press. Also available as a very special artist’s modified edition of ten, at £250 per copy. Please email us directly at contactee[at]strangeattractor.co.uk for further details. For almost two decades now, Tessa Farmer has been evolving a new species of fairy. They represent the point at which science tilts into fantasy – as the sleep of reason produces monsters. In Fairyland is the first substantial scholarly volume devoted to Farmer’s work. Here, leading thinkers in the fields of animal art, natural history and gothic studies assemble to investigate the significance of Farmer and her fairies, covering aspects from their relationship to fairy traditions in folklore and art, to entomological precedents for the malevolent behaviours of her creations. Edited by fantasy curator Catriona McAra, In Fairyland consists of eight carefully crafted chapters by Giovanni Aloi, Gail-Nina Anderson, Gavin Broad, Brian Catling, Jeremy Harte, Petra Lange-Berndt, and John Sears. 'Perfectionism does not seek to be perfect. Neither does it claim to showcase perfect artists. Instead, this is an exploration of perfectionism of process. Kirsten Baskett, Sarah Craske, Tessa Farmer, Paul Hazelton, Mair Hughes, Bridget Kennedy and Polly Morgan. 'The white-cube space of Studio 3 Gallery has been transformed into a dark and strange chamber that brings together newly commissioned artworks and historical objects in a modern Cabinet of Curiosities. Exploring themes of mortality, time, memory, and metamorphosis, artwork and non-art piece works in balance to create an aesthetic located somewhere between a dusty old museum and a contemporary gallery. Introducing visitors to the space is Musei Wormiani Historia, a seventeenth century engraving showing the famous cabinet of curiosities of Ole Worm, a Danish physician and antiquarian. As they step into the dark green gallery space, visitors are greeted by Victorian taxidermy birds, volcanic dust, and insect specimens on loan from the Beaney House of Art and Knowledge, alongside works by artists including Paul Hazleton’s illuminated cabinet of intricate works made from dust, bones, and found objects, Sarah Craske’s biological cabinet of dormant bacteria harvested from the pages of Ovid’s Metamorphoses, and three illuminated sculptures encased in resin by Kirsten Baskett. 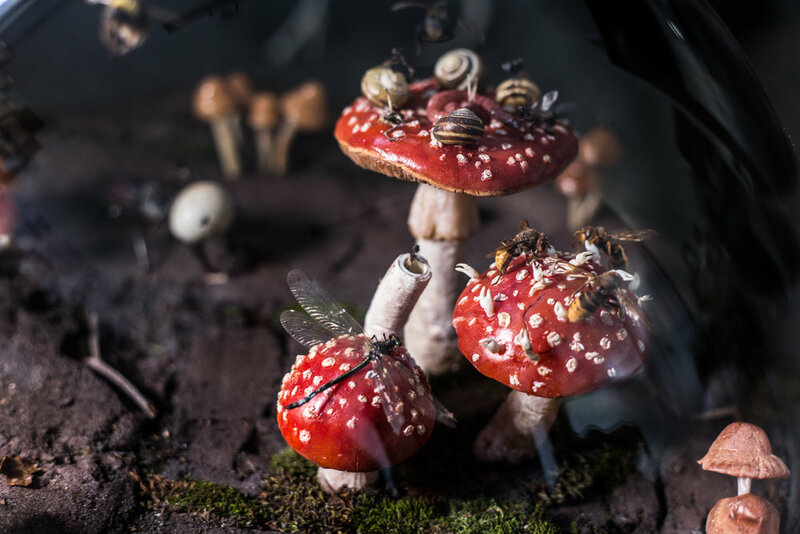 Tessa Farmer’s work is an exquisitely complex depiction of a fantastical battle between insects and fairies constructed entirely from biological specimens. Mair Hughes’ bold lens and landscape drawings with accompanying sculptures interrogate biological and physical science and our own epistemological limits. Bridget Kennedy’s sculpture investigates memory and the development and decay of the now-decommissioned Wylfa Nuclear Power Station in Anglesey, North Wales. The sculptures engineered by Polly Morgan feature taxidermy chicks in a precarious and hazardous scene, showing the fragility of physical life and the balance of existence in visually shocking pieces. Jude and Jake have both been personally been actively involved in supporting Peace One Day for many years and witnessed firsthand the impact it has from Afghanistan to the Democratic Republic of Congo. Over the last four years, there has been a series of exhibitions in support of Peace Day at the ICA in London, working with leading artists, who have all helped to raise awareness of Peace Day. In 2001, due to the efforts of the non-profit organisation Peace One Day, the member states of the United Nations unanimously adopted the first ever day of ceasefire and non-violence with a fixed calendar date, 21 September- now officially designated Peace Day. Thousands of organisations and millions of individuals are active on the day, helping to build peace within schools, communities, the workplace and areas of conflict, resulting in a significant reduction of violence. A new free art exhibition inspired by the South Dorset Ridgeway and commissioned by Artsreach will be touring Dorset this summer, accompanied by an exciting range of traditional craft workshops for adults and families to enjoy. Featuring commissioned works from six local and national artists, Dan Bendel, Sarah Butterworth, Isla Chaney, Tessa Farmer, Susan Kinley and Amanda Wallwork have each created the Field Days exhibits in a variety of mediums, responding to the archaeology, geology and ancient myths and legends of the South Dorset Ridgeway. As part of the Field Days project, award winning folk duo Ninebarrow have also written and recorded three contemporary songs, which will be available to hear at the exhibition. A selection of works by Bill Crumbleholme, a potter with a passion for ancient pottery and Neolithic and Bronze Age techniques, will be displayed alongside the exhibition. Alongside the exhibition, the Ancient Wessex Network bring The History Village to the village green from 11am-4pm on Saturday 9 July. Visitors can enter the ancient village and see a huge variety of authentic and traditional activity, plus have a go at a variety of crafts including beaker pottery, bronze casting, Faience bead and Viking jewellery making. Friday 22nd - Sunday 24th July, 11am-4:30pm. "In Ancient Egypt, hieroglyphs document the role of a ‘Honeyscribe’ tasked to record every drop of honey produced. This Spring, artist Amy Shelton assumes the role of a contemporary Honeyscribe – considering the crucial role bees play in our world and charting the current threats to their health and habitat. Shelton’s project which takes place at Spacex as part of their Associate Programme becomes a hive-like hub offering visitors an uplifting bees’ eye view of their city. An exhibition of the work of twelve artists re-evaluates our ancient relationship to, and reliance upon pollinating insects. Over four weeks three hundred Exeter primary school children will visit the gallery to make artwork of their own, celebrating this precious insect." Artists: Anthony Burrill, Clare Densley, Susan Derges, Tessa Farmer, Alec Finlay, Sarah Gillespie, Zsuzsi Morrison, Peter Randall-Page, Amy Shelton, Jem Southam, Nicky Thompson and Marcus Vergette. PASTORAL NOIR: NEW ENGLISH LANDSCAPES , WOOD STREET GALLERIES PITTSBURGH. Through their visual, sonic and sculptural investigations into the English landscape, the artists in Pastoral Noir have discovered a dark and eerie place. Using science and language, memory and myth, these works immerse the viewer in uncanny landscapes both real and imagined. To coincide with my current exhibition 'In Fairyland' at The Viktor Wynd Museum of Curiosities, the art historian Petra Lange Berndt and I will discuss the exhibition and present a fantastical film reel featuring insects and fairies. I am proud to have new work in this exhibition which will be touring country shows in Northumberland over the summer. Details below. The Gallery Of Wonder On Tour is an Arts&Heritage project designed and led by artist Irene Brown. The tented Gallery tours the Northumberland agricultural shows during the Summer 2015. This is Fairy Cave Quarry in Somerset: a disused and well hidden, very strange place where I will install newly commissioned work in the autumn. The project is Step in Stone and will take place over the summer and autumn of 2015 across three quarries in the Mendip Hills. Fiona Campbell, the organiser, very kindly ferried me around from site to site and we also visited Somerset Earth Science Centre who will be involved. I am now extremely excited about fossils thanks to the enthusiastic manager Gill Odolphie. I returned home happy, with a handbag full of rocks. We are delighted to report that The Wasp Factory has been nominated for a BSFA (British Science Fiction Association) award for best artwork 2014. Tessa's father Mike (an ex scientist) is especially excited as one of his three arty children edges ever closer to science. It's also his favourite book (and Tessa's). This exhibition which includes the Cottingley Fairies and work by Su Blackwell, Sverre Malling and Annelies Strba is on until the 26th February. The Cottingley Fairies fly home in the forthcoming exhibition 'In Fairyland'. It is now almost a century since the infamous fairy photographs were taken in a small village a few miles outside Leeds. In 1917 and 1920, Elsie Wright and her cousin Frances Griffiths took photographs of what appeared to be fairies frolicking by the local beck. These photographs captured the imagination of writer Arthur Conan Doyle whose father, Charles, and uncle, Richard, illustrated fairies a generation before. Taking its title from Richard Doyle’s 'In Fairyland' (1870), this exhibition explores the medium of the fairy and, reciprocally, the fairy as medium. (Through representation) we invite you to re-question your belief in these magical beings. An Injured Herring Gull (detail)", 2013, antique taxidermy seagull, crabs, insects, plant roots, hedgehog spines. Farmer's tiny fairy sculptures offer an entomological, 'accurate' variety with body parts poached from wasps and butterflies. Her fairies have twisted instincts when compared with the decorative Cottingley paper cut-outs propped up with hatpins. Farmer's fairies don't dance; they swarm. Clustering around Farmer's insidious species will be several other examples of 'Cottingley art' including the photographs themselves. This includes my work and features an image from 'Little Savages' on the front cover. This exhibition brings together the work of four artists who all explore notions of beauty and alienation, attraction and repulsion and the otherworldly in their use of materials and form.